Before joining the union, I worked for a few contractors in the Lancaster and York Area. With the last contractor, I felt I had found a good shop and great place to work. A few years in I felt that my co-workers and I were getting taken advantage of. I tried to bring it up with the owner several times and just got the run around! Finally with persistence, I was basically told "so what, just be glad you have a job!" Luckily, my cousin was a member of Local 229 and introduced me to Steve Selby. I listened to his pitch about the IBEW. I thought, man this is too good to be true. But, what did I have to lose? I'll give it a shot. Seven years later I am so glad that I did! Since joining the Union I have bought a home and started a family. The pay and great healthcare that I receive gave me the confidence to do so. Being in the IBEW also has provided great benefits that allow me to plan for my retirement. I know I would not have these benefits without the union! If you're thinking of joining or on you are on the fence, believe me, you will not regret it! My only regret is that I didn't join the Union sooner! Seven years and many more! "I started in the trade working for a non-union contractor in York in the mid 80’s. I completed the ABC electrical apprenticeship and worked with the same non-union shop for over 15 years. My main reasons for deciding to join the IBEW were that the company offered a very limited retirement. It was clear that this would not sustain my future. Also the company had limited resources to provide extra manpower that was actually qualified to do the job. This along with a limited tool supply by the company would constantly create safety issues that if brought up to management would be discarded. My experience in the IBEW has been great. I have a great retirement plan which provides security for my future. The electrical contractors that I have worked for provide a great environment as well as they have the qualified people to get jobs completed. I would encourage any electrician to do the research on what the Union really is. Put aside what you may have heard because there is a lot of false and negative information out there about the Union. Go check out the IBEW. It’s one of the best decisions I have ever made." My name is Mike Brady. I’m a proud IBEW member that retired in 2015 after 40 years of service. I got into the trade in 1974 by shear happenstance. I was traveling the country and had stopped in North Carolina to see friends. I ran into a guy from the IBEW that told me about the apprenticeship program. So my stay in the Carolina’s got extended and I got into the apprenticeship which was 4 years at the time. I have always enjoyed traveling so once I was finished my apprenticeship I hit the road. I travelled to different Locals across the country working on amazing projects from Nuclear Power Plants, refinery’s, Shopping malls, skyscrapers and more. I ended up meeting someone and settled in the York area in the early 1990’s. I worked in the area as a traveler for a few years and in the late 1990’s I transferred my membership card to IBEW Local 229. Working in the IBEW and especially in Local 229 for the last 15 years of my career was fantastic. I met so many great people and experienced a lot of different jobs. I have seen and felt the ups and downs of the economy from the eyes of a tradesman. It wasn’t always easy but being a member of the IBEW provided me with more security and stability than I could have gotten anywhere else. I have a great pension, annuity, and healthcare provided by the IBEW. Now that I’m retired I spend time with my family and dog, ride my Harley Davidson and just enjoy life. I’m so grateful that I ran into the IBEW so many years ago. My career as an electrician started in high school, Vocational technical school to be exact. High school gave me a look into the field with hands on training, and basic fundamentals. After graduation, I joined a reputable non-union contractor and started my apprenticeship. I quickly learned that it was a hard field to be successful in (or so I thought). I moved through various contractors through my 9 years in the non-union side of the trade. Chasing promises, and raises, this all came up short or with fine print. Then, along came an opportunity to become an IBEW member. I was hesitant at first, really hesitant. Years of non-union work had me working with electricians that “knew” some guys in the union and they relayed horror stories, and used “dues” to discourage me. The negatives seemed overwhelming. I fortunately knew a friend that did make the change and joined the IBEW, and he was extremely satisfied with the union. So, I made the move and never looked back. I quickly experienced noticeable positive changes working union. This is mainly due to the agreement that is made between members and contractors. First was the pay. Union wages and benefits are great. Second big difference was the work environment was safer and cleaner. Third was job security. Once you have a Union ticket it’s your resume/job application all on one piece of paper and good anywhere in the United States. No more going to contractors and putting applications in and bargaining your future away, by yourself. You now have the whole IBEW in your corner. I can go on and on but the best I can say is that if you are non-union you probably have not heard the true facts of IBEW membership unless you have met with someone from the hall. Do yourself a favor and go for it. My name is Jared Barley. After graduating High School I went to YTI in York for the electrical technician program for 9 months and graduated in 2009. I then wondered at 19 years of age, how was I going to pay off $17k in college loans? I decided to join the Army Reserves in 2009, went off to basic and AIT, came home and actually got a job at a small non-union company installing security and fire alarm systems. I worked for them for about 6 months when I was approached by a co-worker who had recently went to an electrical job fair in York and while there he spoke to a representative from the IBEW. He apparently liked what he heard, enough that he talked to me about the benefits of joining the Union. He met with Steve Selby from Local 229 on one occasion and then asked if I would meet with him as well. So I did and that led to me and my co-worker joining the IBEW. I was able to successfully complete the IBEW apprenticeship and become an IBEW Journeyman. Fast forward 6 years later and here I am at 27 years old, happily married, with 2 dogs, and experiencing things I never would’ve guessed I’d be able to do or see. I owe it all to my career in the IBEW which has provided me with job security, great wages, great benefits and to top it off, countless friendships. If you are working non-union you need to seriously evaluate your current situation and speak to the IBEW about becoming a member. "I contacted the Local 229 last winter in response to their add for experienced electricians. I had never worked in the union, so I have to admit, I had no clue what to expect. 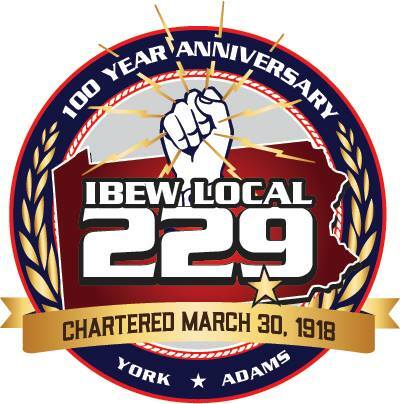 From the moment I walked through the door of IBEW Local 229 in York, I was treated with nothing but respect! Steve Selby did a great job of explaining what this union hall was all about and what kind of rates and benefits they were getting for their electricians. I took the placement test and ended up getting placed at a large jobsite in York in a matter of weeks. After a few weeks, I was bumped up to the next pay level based on performance. This really meant alot to me because it showed me that they really cared about their electricians and paid attention to their performance. Every couple of weeks they would call me and ask me how things were going and if I was happy with things. The bottom line is that when you go to work you're treated well and given good wages. In 14 years as a non union electrician, I was never treated as well as IBEW Local 229 treated me!!"